Cost of job depends on scope of project. I first became aware of Sifford Garden Design through the May 2018 issue of Southern Living. 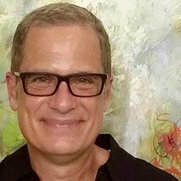 Steve Bender, the "Grumpy Gardener", had written an article about Jay and his garden in Charlotte, NC, and our aesthetics lined up so completely that I knew right away this is who I wanted to help me bring my "Piedmont Zen" garden ideas to life! I called and set up a site visit for the following week, and it was as if I had known Jay forever. He took my basic ideas and wish list and turned them into something much more fully realized and cohesive that I could have ever done on my own. 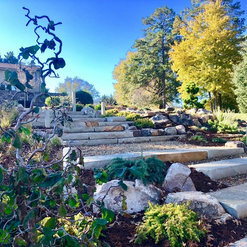 Jay and crew installed the hardscape in the brutal days of July and August, creating stone steps that anchor my house to the landscape and create a visual rhythm with my roof line and front porch pillars. 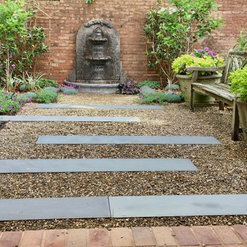 There's also a seating area defined by a gorgeous stacked stone seating wall (kudos to Rob) and wrapped with my coveted dry creek bed which Jay managed to seamlessly transition from dry to wet with a melodious waterfall dropping into a small pond. The crew returned in late November to install the plantings, and Jay's guidance here was spot-on. 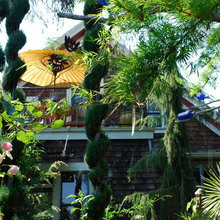 It's a harmonious mix of conifers and shrubs and grasses, with several of the funky specimen trees that we both love. Final touch was in mid December when lighting was installed - it is magical at night. 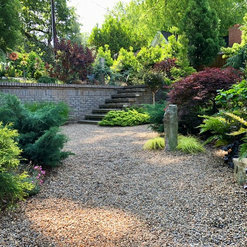 They also planted a previously boring natural area that had nothing in it but an oak tree and a chaste tree, and turned it into a beautiful natural garden. Jay and his crew are not only hard workers, but they are meticulous, with an attention to detail and customer service that you don't find very often anymore. I have zero complaints, and would recommend Sifford Garden Design without hesitation. Their work is far above average, creating beauty and harmony and magic. Can't wait to begin the next phase! We had been contemplating contacting a landscape designer for a long time. We were not impressed with what we were seeing locally. 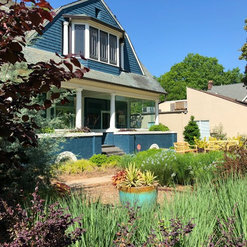 Then......We saw Jay's private landscape featured in the May 2018 edition of Southern Living and after researching his scope of work, we knew he was a perfect match for our project. We had a long list of wants/needs and Jay delivered on them. Had there been an endless budget and no HOA constraints, the sky would have been the limit. His team is perfectly wonderful and Rob is the "pro" if you need any rock/patio stonework. Jay re-visited our new landscape a few weeks later and "fine-tuned" it to perfection. We couldn't be happier! A true artist and professional! Jay is a true artist! The final project exceeded expectations. His crew is hard working and professional. After meeting Jay, My husband told me “let Jay do what he wants and it will be great!” I did and it was. He is also very respectful of budget. 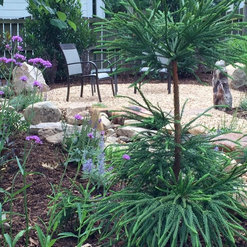 Jay Sifford transformed a disjointed back yard and side yard into a beautiful cohesive space. We now have an amazing dry creek bed with shade plantings! Our back yard just glows! 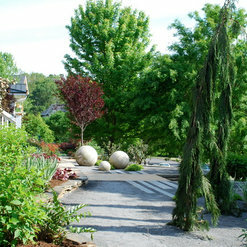 We love the new curved gravel path with boulders. His plan kept in mind our birds and wildlife. To save time and expense, we chose to walk thru the plan instead of having a formal drawing. His team moved and replanted some existing plants. They watered and cleaned up at the end of each day. The photos are before final mulch. We are thrilled with the results! I have long been a do it yourself gardener but work demands made it difficult to make progress in our landscape endeavors. 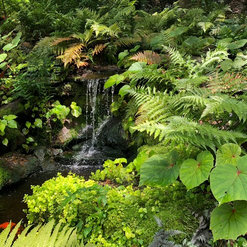 We needed someone with excellent design skills and a wide ranging plant knowledge to help bring our gardens to a higher level. Jay proved to be exactly who we needed. In our front yard we desired an informal relaxed looking vibe but also at the same time be something that had tasteful design elements. For this Jay created a matrix design which incorporated grasses, shrubs and various pollinator plants. This garden is nearly two years old and it looks fantastic. I think it will only get better looking with time. In our back wooded area Jay designed a woodland retreat with masses of ferns and woodland shrubs. Jay and his team also designed and installed a circular flagstone sitting area with built-in boulders which gives it a unique custom feel. The wooded area is still a work in progress but Jay put in place a solid foundation for us to build on. I don’t think we could have gotten to this point without his ideas and creativity. 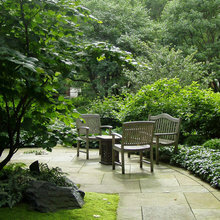 In summary, if you are in need of design help for your garden areas I highly recommend Jay. He is a great guy to work with, extremely creative and also manages to get things done on time and on budget. If you hire Jay and his team you will not be disappointed. Jay transformed our front yard. We knew we wanted to change things up, but we did not have a vision. We knew from the moment we met Jay that he was special and gifted, so working with him was an easy decision. Jay is really an artist whose medium is plants and trees. It’s been a great experience from start to finish. His designs are innovative and beautiful, and he is a great communicator. His crew is professional, courteous and hard working. We love the finished product and enjoyed the process too! As a new professional in the industry, I have seen and admired Jay's work from a distance. I have made it a point to attend his lectures and meet with him to "pick his brain", hoping that I some of his magical ideas will rub off on me. In my opinion, Jay's best quality is his ability to communicate with the land, and really get to know the spirit of the space. His willingness to listen and observe the elements of his project sites is what really sets him apart. The creativity and execution of his designs are always breathtaking. Nothing is done without careful consideration and reason. I can't give enough praise to Jay and his team. They are truly some of the best in the business. If you love your home as much as we do, you won’t use anyone other than Jay Sifford for your landscape design! 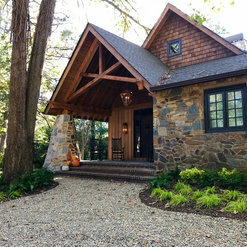 We contacted Jay after seeing him listed as the “best” on Houzz.com, and our experience from the first meeting through project completion did nothing to contradict that designation. Jay is one of the rare professionals who can balance being a master of his craft with managing the more “administrative” aspects of a project. 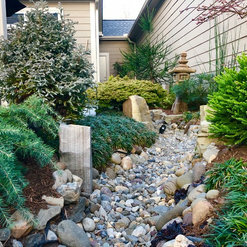 His design for our backyard included a beautiful stone retaining wall, that made the slope we had always viewed as a flaw seem to make perfect sense. We also received consistent, informative updates throughout the entire process that kept us involved and feeling comfortable. As a homeowner with goals in mind and money to spend, it’s easy to adopt the mindset that the professionals you contact should want your business. However, if we ever required help with landscape design and execution in the future, we’d be crossing our fingers that Jay would accept us as return customers. 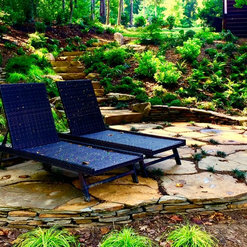 Jay is a true artist, a rarity in landscape design and especially in the Charlotte area. We are truly lucky to have him in this region! 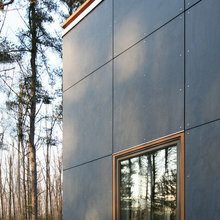 I found Jay via Houzz and fell in love with his designs. He puts his all into everything he does - from customer service, to communication, to plant choices and landscape design, Jay goes the extra mile. He's a genuinely lovely person and truly cares about his clients as well as his work. Of all the projects we've had done to the house, the yard is my favorite because of Jay and his excellent team. I highly recommend him! We've hired out several projects over 30+ years of home ownership, both interior and exterior. 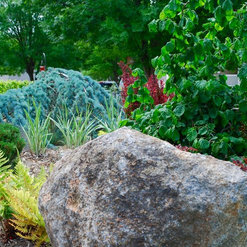 Our investment in Jay's garden design and implementation is the single best investment we ever have made in a home. He gave us a beautiful yet practical garden designed for our terrain. Because of Jay, the front or back yard is now my favorite room in the house! Thank you Jay Sifford Garden Design. The most difficult thing about this recommendation is where to start with the praise? Jay's communication patterns, plant knowledge, design sense, and quality of work are just outstanding. 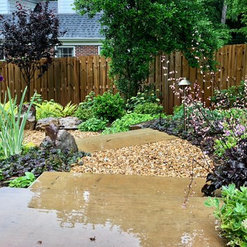 We looked for a landscape designer by googling "Asian-inspired garden design in Charlotte, NC" and thanks to houzz, we found Jay! He listened intently to what we wanted in our new location and then encouraged us gently to consider some ideas outside our initial thoughts to follow his excellent advice. And we're so glad we did, because what he has created for us in a relatively tiny courtyard is just extraordinary. In addition to downsizing our indoor living space with this latest move, we'll be able to thoroughly enjoy and nurture a beautiful garden space as well. Stunning transformation! Jay and his crew worked their magic on my suburban backyard. The result is nothing less than stunning. Jay incorporated my suggestions and needs into a thoughtful all season design full of wonderful bird attracting plants. The resulting garden is above and beyond my expectations. I cannot say enough about this man's talent! The glass art he selected is a beautiful finishing touch. I am delighted! Commented: ThanksMy pleasure. Happy gardening! Commented: conifer in foregroundThose are 'Mr. Bowling Ball' arborvitae. In enough sun, they &quot;bronze out&quot; for the winter. Hope this helps.